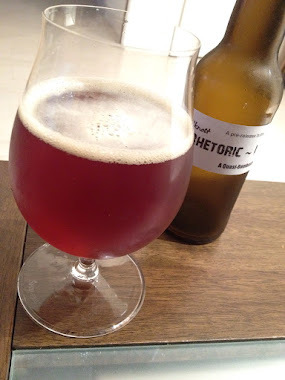 At the European Beer Bloggers Conference I was lucky enough to be given one of the 24 bottles of Hardknott Rhetoric #1 up for grabs. Essentially a pre-production sample of the first Rhetoric Beer, this bottle makes up part of a new line of experimental, limited edition, boundary pushing beers being put out by Hardknott. Personally I think it's a great idea, I've drank some stunning beers from BrewDog's similar Abstrakt range and definitely think there's a place in the market for mental beers, so hopefully this endeavour will be a success for Hardknott. As you can see, the beer pours a beautiful glowing, deep red-amber with a foamy white head which stuck around pretty well for a beer tipping the scales at 10.2% abv. The carbonation was quite low for a quad, if we're marking to style, but actually to my tastes pretty spot on. The aroma is sweet, sticky malt, cola and a touch of liquorice. In the flavour the star anise comes through straight away but certainly doesn't overpower, I hate aniseed so I was a little worried the flavour would dominate. Alongside the star anise there is loads of rich sweet orange and red berry fruit alongside a dark rum booziness. The mouthfeel is full, slick and slightly chewy, but cut through by that perfect carbonation. There's a really great bittersweetness in the finish, telling me that they've used enough hops to keep the sweetness in check and balance out the beer. It's a big beer but there's also a deftness of touch in the hopping which helps to keep the malt sweetness in check, and the star anise adds a layer and depth of flavour rather than dominating like it so easily could have. I really enjoyed it, and can't wait to see what comes next in this exciting range of beers.